World War One ended on November 11, 1918. At a meeting on Thursday, April 10, 1919, it was decided to create a memorial in the cemetery containing the names of all those that fell in the war. A special committee was set up to raise money and decide on the shape of the memorial. Over 245 pound, 5 shillings and 10 pence was raised, around £10,500 today. 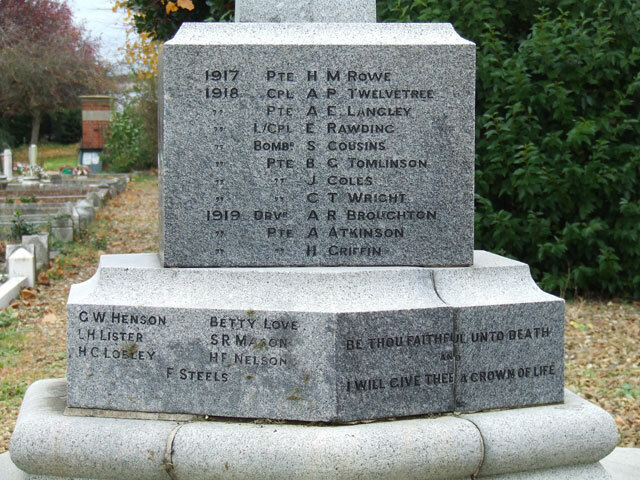 The memorial was designed and created by a Mr Charles Gray of Walton. 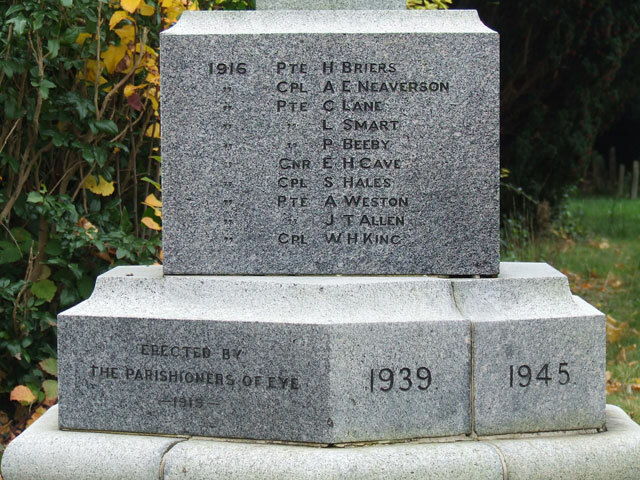 The Parish War memorial was unveiled on Easter Sunday of the 4th April 1920. 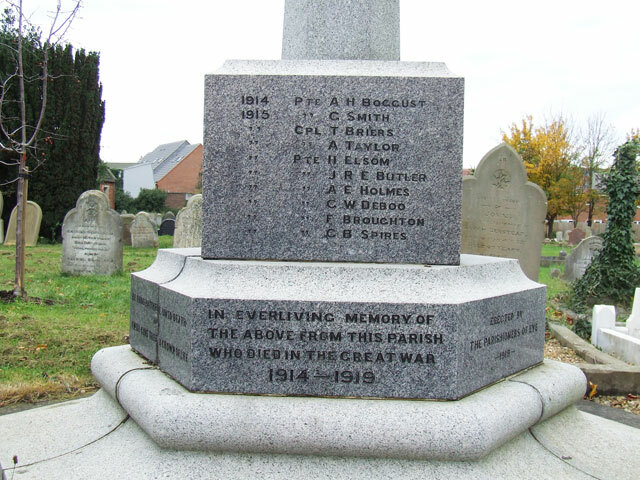 A number of memorials across the city were unveiled this year, the following week saw the Memorial Lynch Gate at Woodston Church also dedicated. 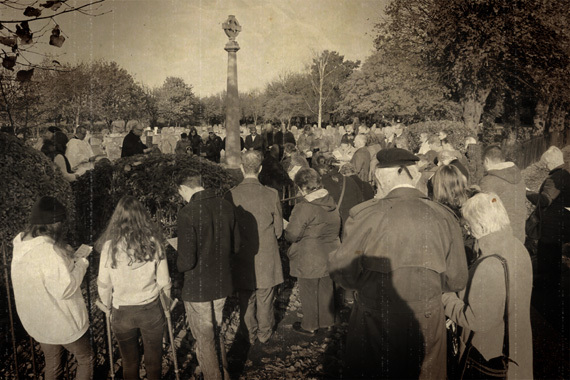 The story of the unveiling was covered in detail in one of the local newspapers at the time: “In spite of the rain, there was a crowd such has rarely been seen in Eye, the part of the Cemetery where the memorial stands being crowded with relatives and friends of the fallen. Amongst those present were MR. S. M. Egar, MR, G. W. Moore, junr., Mr. and Mrs. Jos. Coles, Mr. and Mrs. J. T. Briggs. The Misses Briggs, Mrs. Little, Miss Little, Mr. J. J. Harrison, Mr. and Mrs. C. T. Turnell, Mr. P. Turnell, Mr. T. Roberts, Mr. and Mrs. T. Bonser, Mr. B. Brown, Mr. J. Brown, Miss Brown, Mr. and Mrs. Jas. Durrant, Mr. W. Brown, Mr. Stimpson, Mr. and Mrs. J. Bradford, Mr Geo. Neal, Mrs. Neal, Mr. and Mrs. Jos. Yates, Mr. and Mrs. Yates, junr., Mr. and Mrs. G Langley, Mr. Perkins, Miss Perkins, Mr. and Mrs. C. E Love, Mr. G. Self, Mr. and Mrs. Clayton, Mr. A. Peach, Mr. H. Andrews, Miss Andrews, Mrs. H. Oldham, the Miss Andrews, Mrs. H. Oldham, the Misses Oldham, and many others. The ex-service man of the village were present to pay a tribute to the memory of their fallen comrades. They walked in procession to the Cemetery, marshalled by Mr. W. Ise. Those taking part in the procession were Messrs. A. Whittington, E. Preston, J. Tiggerdine, . Gunns, S. Atkinson, F. Steels, H. Shaw, R, Sutherland, C, Lappage, G. Spires, R. Shipp, J. Coulson, J. Hall, A. Redhead, F. Alen, F. Peacock, J. O. Yates, G Lappage, H. E. Bland, E, Wright, S. Love, A. Hudson, G. Baldwin, E. Fowler, J. W. Fowler, E. Whittemore, F. Hall, R. Hopgood, H. Steels, W. Steels, J. W. Booty, F. Bossingham, D. Pachett, L. Johnson, H. Gunn, R. Christian, G. Mason, B. Dawson, J. Rowe, W. Chapman. An impressive service opened with the singing of “O God Our Help in Ages Past,” followed by prayers by the Vicar, who read out the names of the fallen. The Rev. W. Softley said there were many present who know most of the men to whose memory they were paying a tribute. He was in the unhappy position of not knowing one of them – they were all names to him representing the loved ones of Eye people. But though he did not know them, he could enter in the sympathy they felt because he had met other men whose passing had been a great grief to him. After referring to the courage those men displayed in the face of difficulties and danger, he said they won a great victory, and the peace we were enjoying should make them remember with great gratitude the boys whose lives were given in gaining peace. Ald. 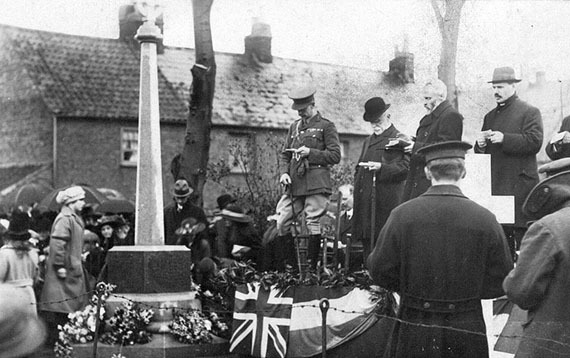 W. G. Moore (Chairman of the Memorial Committee), in introducing the Marquis of Exeter, said he felt very privileged to be calling upon Lord Exeter, who, as they all knew, did his bit in the war, to unveil that monument to the memory of those gallant boys who gave their lives for them. At Eye they had done all that in them lay to perpetuate the memory of the boys who fell. Rev. J. Carbis associated himself with previous speakers “in paying homage to the men of this parish who went to fight for us.” The unveiling of that memorial, he said, would become closely intertwined with their lives, for as they passed and re-passed it they would think of those who went forth and made the supreme sacrifice. It reminded us for the moment of a certain condition or type of life existing before the Great War broke out. Their men went forth to destroy certain conceptions of life that brooded ill for their own civilisations. It spoke, too, of their present-day duty. The men shared in fighting for great ideals, and to see to it that no such war could again mar the stability of our civilisation. Mr L. Johnson, speaking on behalf of the ex-servicemen, said three thoughts occurred to him – regret, pride, and sympathy. They all felt deep regret in the fact that the necessity arose which called for the laying down of lives. The ex-servicemen all felt pride, as, doubtless, did everyone present, in paying a tribute to the honour and memory of those men who gave their all. And sympathy they all felt, sympathy with the relatives of those who laid down their lives. He was sure that all of them who had lived to come back and take their part as citizens of that village, felt it be a great source of pride to pay that tribute to the memory of their dead comrades that afternoon. At the top of the tapering hexagonal column is the granite Celtic wheel-cross and the whole memorial stands around 12 feet high. 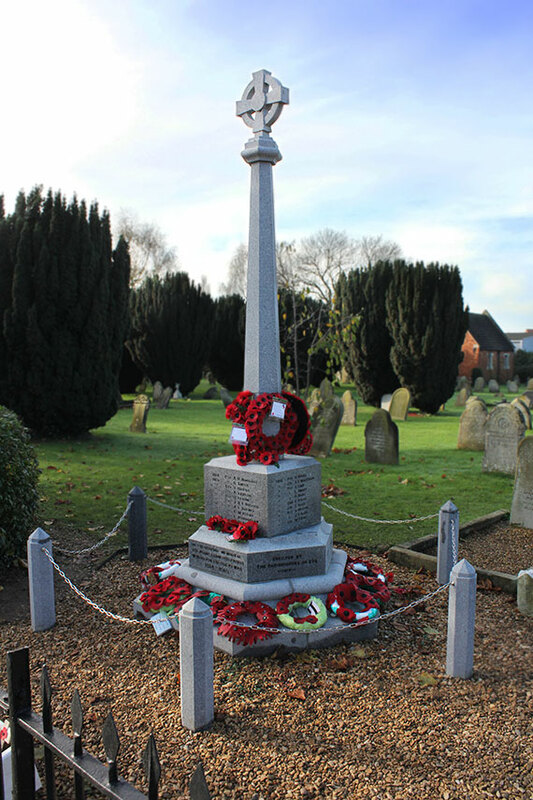 In 2014 War Memorials Trust offered a grant of £235 towards the conservation of the memorial. 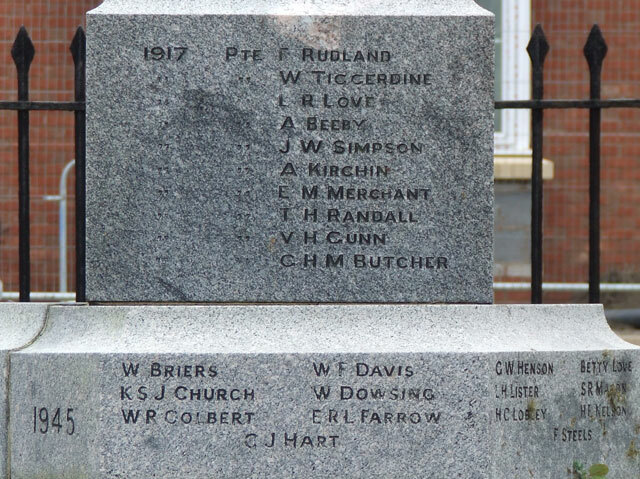 Works included in the grant offer consisted of cleaning the memorial and re-pointing all open joints lime. The Parish Council then paid for re-enamelling the lettering, removal of the concrete surround and replacing this with gravel and erecting a surrounding chain-link fence with hexagonal granite posts. Along with memorials at Thornhaugh and Wansford, Maxey and Deeping Gate, Werrington and Newborough the memorial was Grade II listed in March 2016.